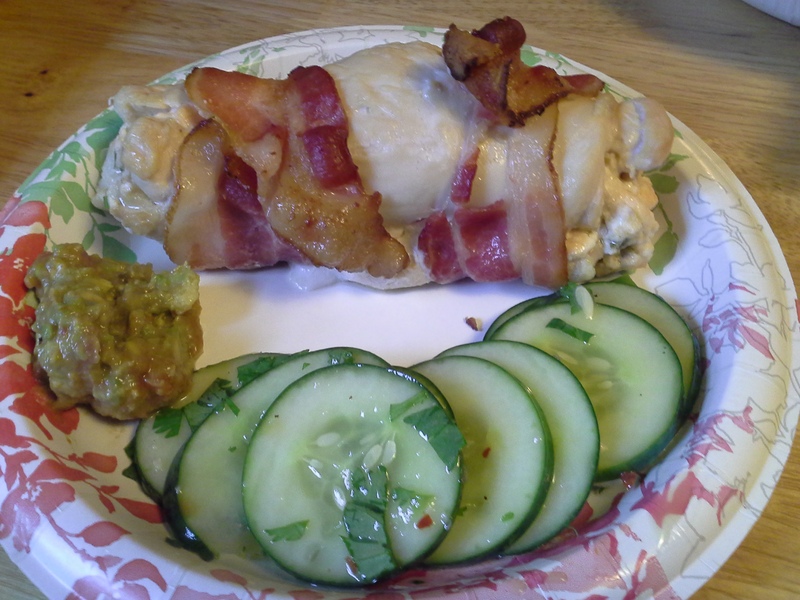 A few weeks ago, I made a low-carb version of Chicken Cordon Bleu as a way to dress up just plain-ol’ baked chicken for dinner. I’ve decided that pounding out chicken breasts isn’t too difficult—and is, in fact, fun and stress relieving—so I’ve been on the lookout for other “stuffed” chicken recipes. This time, I wanted something a little more flavorful, and what’s more flavorful than jalapenos? Well . . .
Cut the top/stem and very bottom point off of the jalapeno, then cut into quarters lengthwise. Using the paring knife, carefully remove the seeds/white membranes (this is where the heat resides in the pepper, so if you want more heat, leave more of the white membrane in tact). After seeding, slice the pieces lengthwise into thin strips, then chop these into small pieces. Set aside. In the skillet, over medium heat, partially cook the bacon. It shouldn’t have much color, but it will be starting to get slightly crusty around the edges. You want it to still be flexible enough to wrap around the chicken. 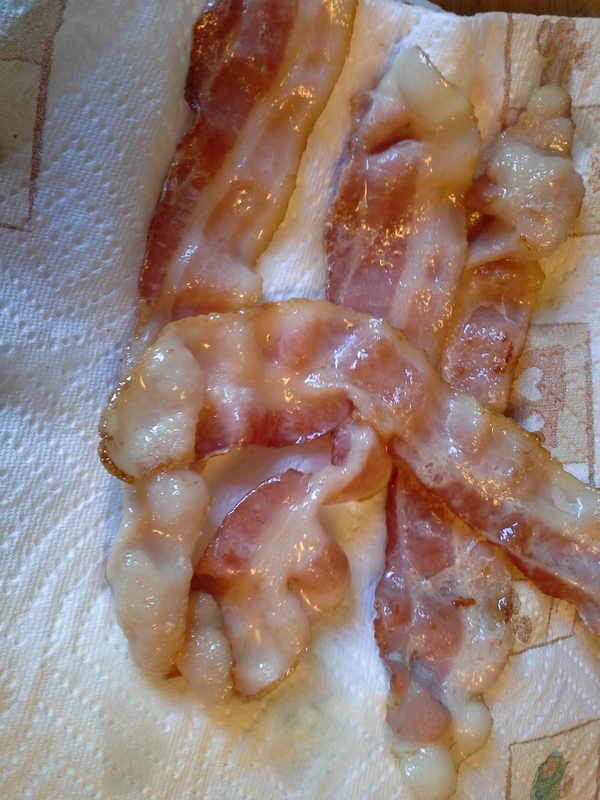 Remove bacon from pan onto paper towels to drain. Add olive oil to bacon drippings (still on medium-heat stove burner). Place jalapeno and garlic in hot oil and sauté, stirring constantly, 2 to 3 minutes. Add cream cheese and cheddar; stir until cheeses are melted. Pour cheese mixture into a bowl and set aside to cool while preparing the chicken (you may need to drain off any excess oil/fat). 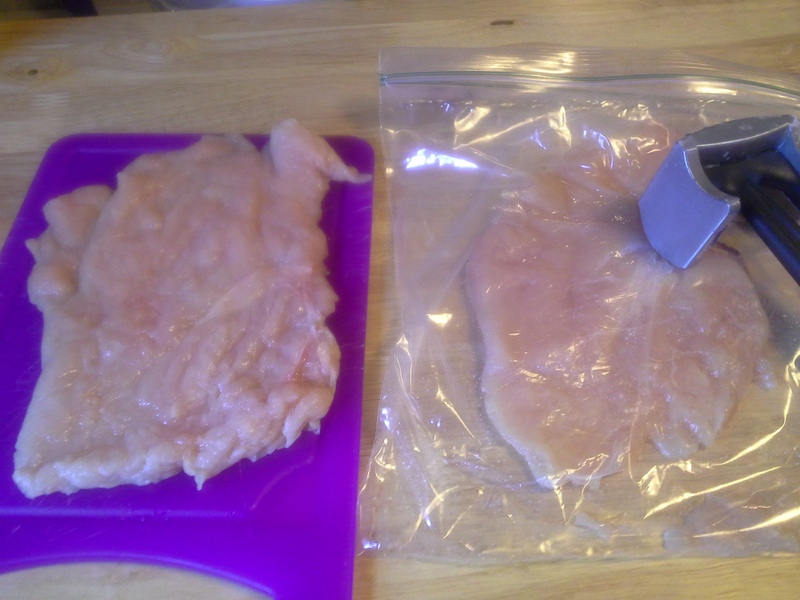 Place one piece of chicken in the zip-top bag and, with the smooth side of the meat mallet, pound out to about 1/3-inch thickness (this is known as a paillard). Repeat with second piece. 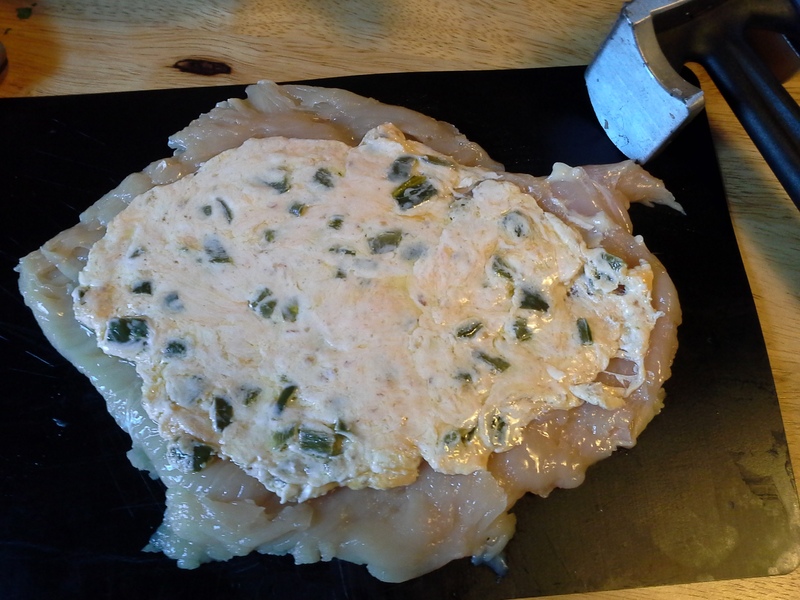 Sprinkle chicken with salt and pepper, then spread half of cheese mixture inside each paillard, leaving about a 1/4 inch margin all the way around to prevent the filling from squirting out the ends. Carefully roll up the chicken, with the cheese inside. 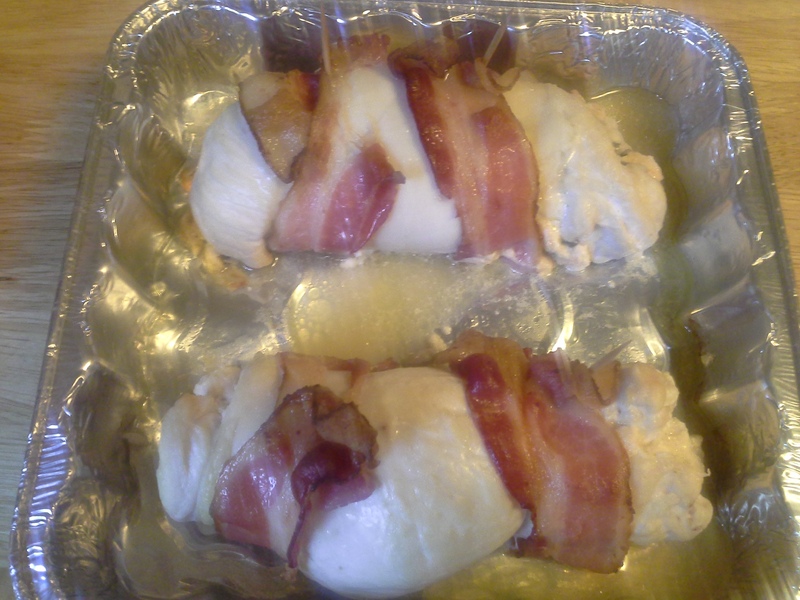 Wrap with bacon and secure with toothpicks/skewers and place in 8×8- or 9×9-inch baking dish. Bake about 30 minutes or until chicken juices run clear. Let sit about five minutes before serving. I ate it with 2 tablespoons homemade guacamole (1/4 avocado + 2 teaspoons salsa = 71.5 calories, 1.3 g net carbs), and a serving of the Cilantro Lime Cucumber Salad I made the other day (103 calories, 2 g net carbs). You’d think that with the garlic and jalapeno, it would be plenty flavorful, right? Wrong. Bland, bland, bland. Thank goodness for the guacamole! I will chop up the bacon into bite-sized pieces and cook it through to incorporate it into the filling. 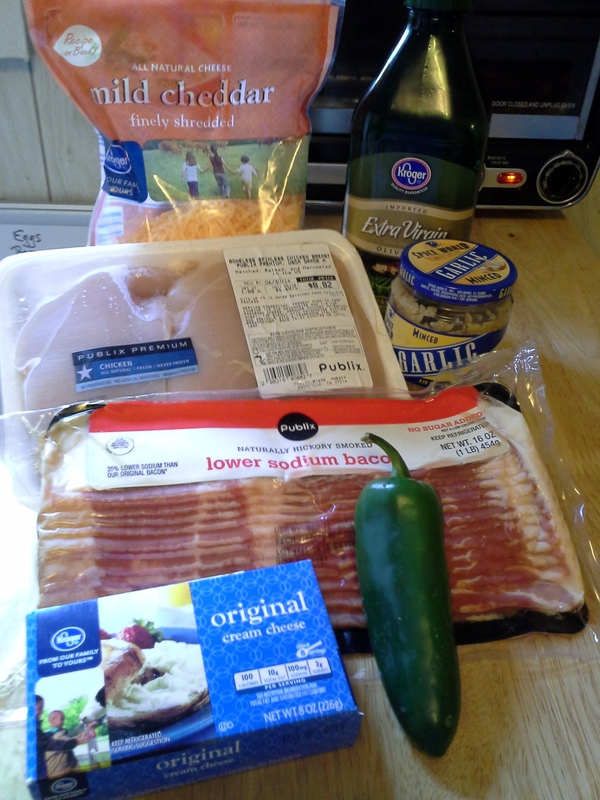 I will sweat about 1/4 cup onions in the bacon drippings before adding the jalapeno and garlic. Onion would add more flavor to this. I will use 1/4 cup of sharp cheddar. Two tablespoons of mild didn’t add any flavor. I will try it with green chiles instead of jalapenos. I will cut each roll in half for a serving. A whole one of these was way too much food even with just the cucumber salad as the side. I will drizzle the chicken with melted butter before baking. About 5 minutes before it’s finished cooking, I will add a sprinkle of cheddar or Monterey jack cheese on top of the chicken. I will give it a different name since I’m changing so much about the recipe. In the Good Housekeeping Cookbook that I have, there is a recipe for “Crispy Chicken Rolls” which stuffs the chicken breasts with shrimp, green onions and butter. Proportions are (for 6 breasts) 1 1/4 cup chopped cooked shrimp, 3/4 c. butter barely softened, 1/4 cup chopped green onions. They pounded the breasts, stuffed with the mix above, then chilled so the butter wouldn’t melt as soon as you started cooking. The breasts were floured and fried but I think you could coat with mayo and some parmesan with Tony’s. I’d probably start them center side down, then turn them over and add the mayo/parm toping. Or an aioli or salsa or whatever.